King Farmers Market offers the neighborhood 35 farmers and food artisans in a safe, family friendly place to spend a Sunday. Shoppers find breakfast and lunch with seating in front of live music. Often shoppers enjoy, food demonstrations and educational or artsy activities for kids. And this is the place to take a fun-filled cooking class for the whole family. 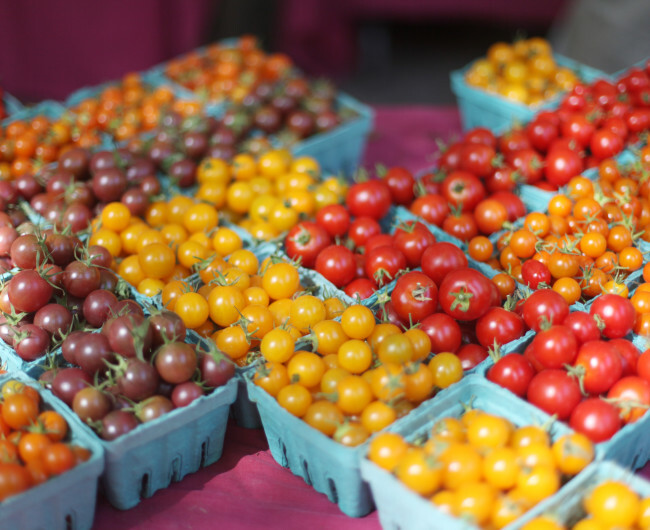 Established in 2009, the King Neighborhood has welcomed this thriving farmers market. Established with support from the Northeast Coalition of Neighborhoods (NECN), the market is located one block south of the vibrant Alberta Arts District. It’s adjacent to King Park & Playground. Market Music: Join us for live music at our music stage each week from 11am-2pm! View our Events Calendar for more information. Kids Classes: Kids Cook at the Market is a summertime program that gives junior chefs ages 7 to 11 the opportunity to learn about the seasonality of food, meet local farmers, and prepare ingredients purchased fresh from the market. Pre-registration is required. Check back in May for registration details. The King Farmers Market is located at NE 7th and Wygant between NE Alberta and NE Prescott Streets — in the parking lot adjacent to King Elementary School. This market is easily accessible via TriMet. Several bus routes provide service just a block or two of the market.